Aspire is built on the same platform as Vectric's VCarve Pro software, sharing the intuitive interface and ease of use for production design and routing. In addition to the powerful drawing and production routing tools of VCarve Pro, Aspire also has tools to let you transform 2D sketches, photos, drawing and digital artwork into detailed 3D relief models and then to calculate 3D Roughing and Finishing toolpaths to accurately cut these shapes. 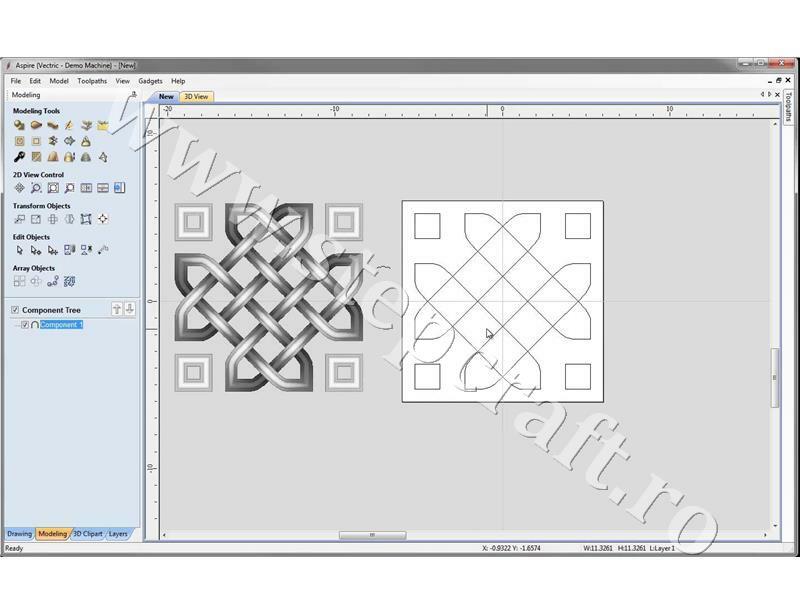 All the 2D Drawing, design and layout tools available in VCarve Pro - layer control, guide lines, Snapping, rulers etc. 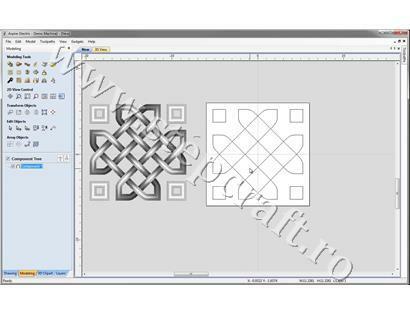 Import 2D vectors: DWG, DXF, EPS, AI, PDF, SKP, SVG etc. Import 2D Images: BMP, JPG, TIF, GIF, PNG etc. Export 2D and 3D files: DWG, EPS, AI, SVG, STL, TIF, etc. Aspire's single interface for 3D component design and machining makes it easy and logical to draw and build 3D component models, plus calculate combinations of 2D and 3D toolpaths to machine high quality projects. Aspire has a unique interactive approach to assembling 3D component models that makes it easy to change the shape and characterisitcs of individual parts of the job and build up complex designs using simple sets of 3D shapes. Flexible design tools allow components to be edited - moved, scaled, resized, rotated, tilted, faded and distorted at any time without having to recreate the component. Aspire's ability create or edit 2D and 3D data coupled with the comprehensive set of toolpath strategies gives you the ability to choose the most efficient ways to make 2D parts, 3D carvings or jobs which combine both with your CNC. Get the most from your CNC by being able to create and cut a wider variety of 2D and 3D parts. Offer your customer a range of cost options from budget 2D designs to higher value 3D products. Customize parts to create unique products for individual customers. Use the large range of tutorials to learn new skills for use on your CNC and to create samples to help demonstrate and sell your capabilities. Not only increase your skill-set and productivity but also your job satisfaction and enjoyment of using your CNC Router. Cerinte minime ale PC-ului pentru a putea rula programul Aspire.